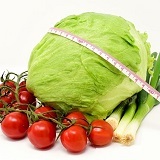 The benefits of a holistic diet are long-term: your overall health and well-being will improve. Following a good diet has more benefits than even exercise, but it is important to remember that the quality of the food you eat is much more important than the amount of calories you consume. Identify the best elements of the fad diets you know and follow them. Look at all the fad diets you know. Identify the elements that follow a holistic approach to eating, and incorporate those into your diet. Remember that calories are not created equal. The belief that you can eat anything in moderation is inaccurate; the quality of what you eat is more important than the quantity. Eat foods with less fat, carbohydrates, and added sugar. Ask yourself if the next food you put in your mouth is a net gain or a net loss, and opt for the net gain. A food that causes a net gain is one that does more good than harm, such as water compared to soda. Opting for fries instead of vegetables, on the other hand, is a net loss. Analyze every single food you eat to see whether it is a net gain or a net loss, and eat those that are a net gain. You should aim to eat at least one cup of broccoli or another green vegetable each day. Results of diets are not instantaneous; it takes about one year for the body to react to dietary changes. Stick with your diet and be patient. You will be happier and healthier for it.